To be eligible for the Excel Fear no Food Contest an individual, must be a resident of and physically located in Canada and have reached the legal age of majority in their province or territory of residence. The Excel Fear no Food Contest ends on April 19 at 4:59:59 PM (ET). No Purchase Necessary. To register, go to excelfearnofood.ca and complete the Registration Form. There is a limit of one (1) Registration per person. Each daily prize consists of one (1) $100.00 Visa prepaid gift card. A total of one hundred and nine (109) Daily Prizes are available to be won, with one (1) Daily Prize awarded for each Contest Day during the Contest Period. The total value of all Daily Prizes over the Contest Period is $10,900.00. 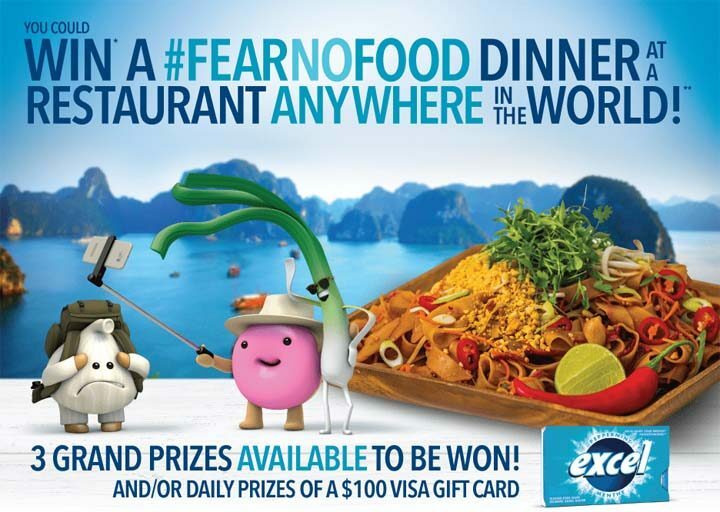 Each grand prize consists of a FEAR NO FOOD DINNER AT A RESTAURANT ANYWHERE IN THE WORLD for one (1) winner and one (1) guest, at a restaurant location to be chosen by the winner, valued at up to a maximum of $12,000.00. Three (3) Grand Prizes are available to be won amongst all eligible Entries received during the Contest Period. The total value of the three (3) Grand Prizes is a maximum of $36,000.00.